How to select a Counter Depth French Door Refrigerator? One of the features you should look at when buying French door refrigerators is the counter depth or cabinet depth feature. We’re pretty sure you have read about that before, and if you aren’t sure about what the buzz is all about, it’s one of the main staples in a refrigerator that most consumers look for. What is a counter depth feature, you may ask? It is a design that allows the refrigerator to perfectly align with your existing cabinetry so that it would give the impression of being built-in or installed. Having this look makes it seem like it is more expensive than it really is because as we all know, having anything installed in the kitchen is quite pricey. Now you get the perk of having an “installed” French door refrigerator, without having to pay for a builder or buying extra cabinets. The design allows the door to stick out, while the entire body of the refrigerator is concealed between the cabinetry, depending on the height of the cabinets that cover the sides. What are the factors to consider when getting a counter depth French door refrigerator? Floor space: It is important to have enough floor space as you’ll have to insert your refrigerator in between two cabinets to make it give that installed look. If you don’t have an enough space, you may need to reconfigure your cabinetry, which may incur a bit of cost. If you want to save yourself the hassle, just buy a freestanding French door refrigerator, the changes are minimal. But if you insist on buying a counter depth French door, you’ll want to get your measuring tape and get the dimensions of the space where you intend to place the fridge. Afterwards, check some counter depth refrigerators in your local appliance store to see if anything will fit. You might customize your space if you find something that you really want but have no enough space. Remember, the doors of the counter depth French door refrigerator should protrude while the rest of the refrigerator is hidden away, as it is the main look you’re going for. Make sure that this is the permanent space where you want to put your French door refrigerator as moving it around again may be hassling, as you either have to move the cabinets with it or customize new cabinets if it doesn’t match the other ones. Cost: Because counter depth French door refrigerators are very fashionable and sought-after, they are generally more expensive than freestanding ones even though it doesn’t really add any usable space. You’re paying more not for quality, not for the additional size, but for the aesthetics. Counter depth refrigerators also look good only if the shelves or the cabinet on both sides of it reach from the floor up to the ceiling. If it exposes the sides, then there’s really no purpose of having it, as the “installed” look is not very obvious. Because of this, you might incur a bit of cost having the cabinets set up that way, if you haven’t already. 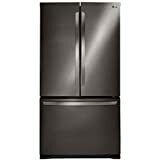 Size: It may also be difficult to find a smaller size of counter depth French door refrigerator, if you’re looking for one that will suit a very small family that is just starting out. Most counter depth French door refrigerator is the standard to big size. Bear in mind that if you don’t need such large storage space, you shouldn’t buy it. 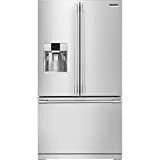 Average sized to big French door refrigerators mostly have the counter depth feature and it’s really good to have if you are a big family (four or more) and if you have big space in the kitchen. Otherwise, you won’t be able to maximize the design and the function. Key Takeaway: The counter depth feature is only a matter of aesthetics. It doesn’t add or subtract anything from the French door refrigerator’s function, shelf size, and other features. Only consider getting counter depth if you have the cabinetry ready for it, if you have enough space, and if you need the storage space provided. Is a counter depth French door refrigerator worth getting? A counter depth French door is worth getting if you already have the cabinetry set up and you have the exact space recommended for it. Since most counter depth French door refrigerators are standard sized, meaning they can easily fit into the standard sized cabinetry, you may not encounter problems. It’s also definitely worth getting if all your kitchen appliances are already built into the cabinetry. You might hate if the refrigerator is the only one that doesn’t follow the supposed design, even if you have to shed a few hundred dollars. But if you’re saving up, a freestanding French door refrigerator doesn’t really have much difference to the naked eye. Key Takeaway: Get counter depth French door refrigerator if you already have everything built-in and if you have the money to spare. It definitely looks gorgeous in the kitchen, but remember that’s all there is to it – aesthetics. A counter depth French door refrigerator looks really nice especially when built into the cabinetry. It is stylish and looks more expensive than what it originally costs. Because this type of refrigerator is built to match the standard size of the average cabinet, it’s easy to push it in between so you don’t really have to customize your cabinetry. In short, you get the beauty and elegance of an installed French door refrigerator without paying for installation and customization.